UPDATE: THE BORDER DESIGN BELOW HAS BEEN ADDED TO THE PDF COLLECTION AT THE EMBROIDERY PATTERNS LINK, ABOVE. 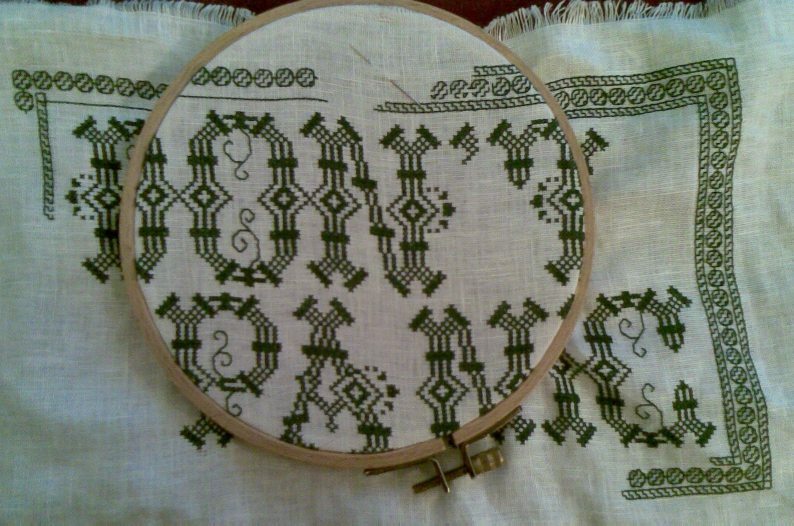 Well, I’ve decided to do a border around Don’t Panic. Again it’s one from TNCM, or rather, two that are presented together in the book. The first one is a very narrow geometric strip, the second is a bead (I think it looks like a march of panic buttons). The pattern is one of my originals, heavily inspired by historical sources, but not a literal transcription of any one design. The book doesn’t present a corner, but in this pattern one is very easy to improvise. 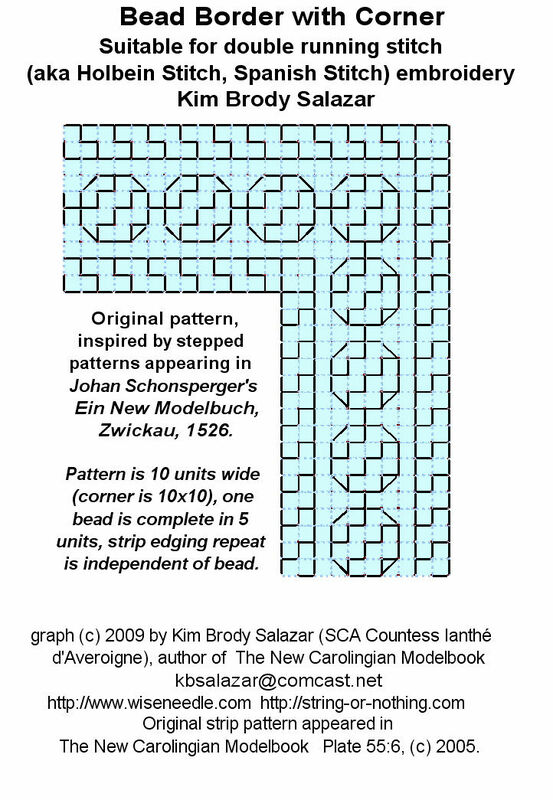 The astute will note that the repeats of the strip edging and the bead unit are different, and that a span of this pattern will not necessarily work out even, with all four corners identical. Because the step strip edging is so narrow this isn’t a problem. It looks fine ending it at the squared off corner with either the little L unit shown above, or truncating it one step earlier so that there is a little square next to the larger corner block (shown on the photo above, in the upper left corner). The key is to make both ends that terminate at the corner block the same so that each corner displays logical consistency. The four actual corners of the work are so far apart that any minor difference in the strip among them won’t be noticed. It is however important to keep the bead units as near complete as possible. My north-south border strip works out to be an exact multiple of my repeat. You can see the happy march of whole bead units on the right. But what about the longer east-west panels? I suppose I could be **perfect** and count them out, or plot the whole thing on graph paper first. But I’m a leap-off-the-pier problem solver. My solution is to work an even number of beads on each side, starting at the east and west corners. When the two sets met in the center if the count is off, I’ll either work a centered elongated bead, or I’ll figure out some other bit of complimenting ornament to fill the center space. I might for example choose the centers to sign and date the work. The narrow strip then presents its own problems. I’ve established the repeat sequence on the right hand side. If I were to start it again from the left, I might run into a similar conundrum in its center. Instead, once I handle the bead problem I’ll continue working the narrow step strip from left to right, letting it end wherever it chooses to at my upper right hand corner. I might have to pick out the little bit of vertical strip already worked at the inner left so I can make it match the horizontal where both strips abut the box corner, but that’s life.